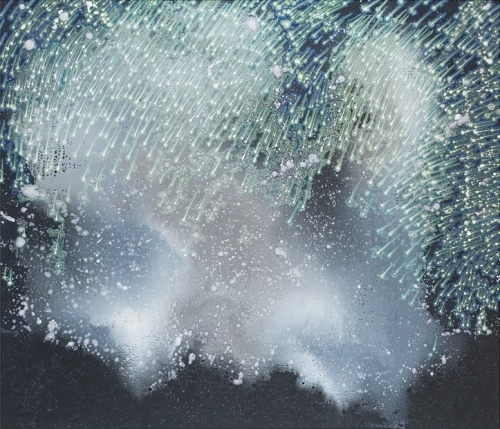 In both their recent exhibitions Bradford and Takenaga mined the skies and seas for painterly inspiration. For each artist the result is a provocative body of work evoking moments of pure whimsy, mystery, and a reverence for the power of the universe and all its many elements. In her most recent exhibition Fear of Waves at CANADA, Katherine Bradford explored states of immersion creating scenarios that carefully balance the menacing and comedic and approach the subject of the universe with a genuine sense of awe and whimsy. Barbara Takenaga’s new paintings on linen and panel continue the artist’s eloquent inquiry into the emotional weight of imagined spaces and natural phenomena. Each carefully constructed composition questions the boundaries of the known by offering visual translations of the ever-changing nature of the physical world. David Cohen is publisher and editor of artcritical.com, the online magazine of art and ideas. He is founder and moderator of The Review Panel, now at the Brooklyn Public Library and the Pennsylvania Academy of Fine Arts. Cohen teaches at PAFA, Pratt Institute and the New York Studio School.